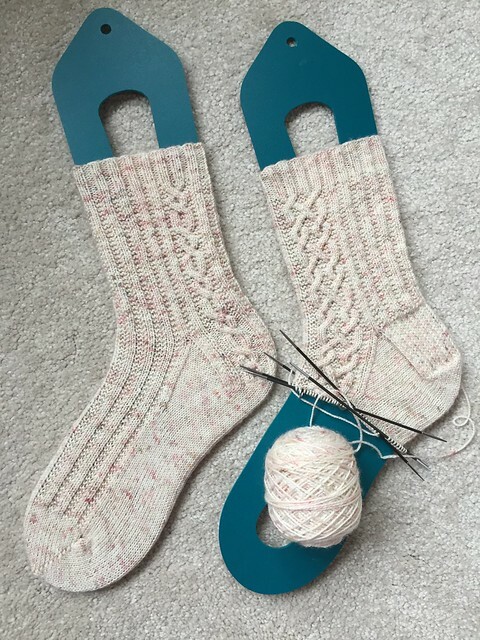 Once upon a sock in November 2018 – yikes! Yikes for more than one reason, too. Firstly, how on earth is it November already? Secondly, I’ve not blogged for a while and I have MISSED you guys! 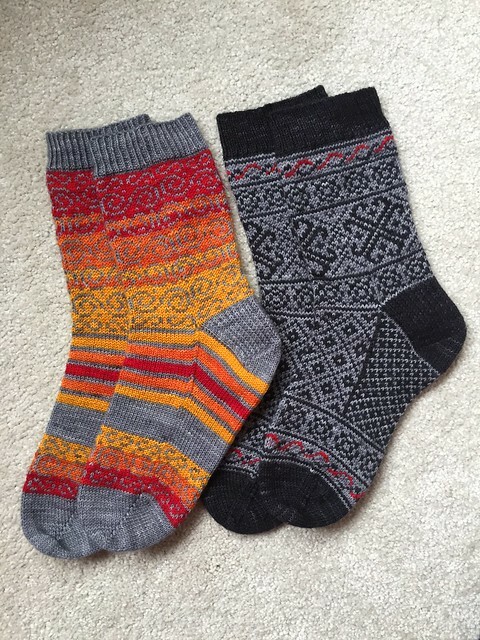 And thirdly I don’t have all that much sock progress to show you, though I do have some little bits and pieces of sock-related news. First off, the progress, such as it is. Here are my Afternoon Tea socks, not yet finished though really really close to being so. I should have wrapped these up a good month ago, but pesky life (work) got in the way and they’ve been neglected. Big push to finish them in the next week or two, so I can get them into testing and hopefully have another pattern to add to the bank. Why yes that is a cable running all the way down the heel, and yes I am especially proud of that detail, thanks for noticing. News, of a sort – is anyone going to Yarnporium? (it’s in Time Out! so officially the place to be this weekend, if you weren’t already going) I’m volunteering this year, specifically tomorrow (Friday) afternoon (and tonight for set-up, though I doubt I’ll see you there unless you’re a vendor or another volunteer), so if you see me then please come and say hello (am back on Saturday to go to a talk so you might see me then too – can’t keep me away). Other news – remember these guys? I’ve been sitting on the Anything with Bubbles pattern for an age but should finally be in a position to launch it in the next month. Some of the test knits for this have been the cutest things I’ve ever seen (the pattern goes down to an XXS size for teeny-little toddler feet) and I am quietly hoping some of my knitting friends with kids (or access to kids) will want to make a pair. Oh and also (alright this one’s not sock-related) my Brighton Rock cowl got finished too so I might manage a couple of launches before Christmas if I get my act together. Proper post on the cowl coming soon, but here’s a little preview (remember those days back when it was sunny??). Yay yay yay! The new socks are looking so pretty and so many exciting things on the horizon! Those new socks are looking fab! Look at that cable that follows the heel! Have a fab time at Yarnporium – I was very tempted but given the house thing, and the skirting boards that need painting before new carpet goes in, it’s probably for the best! Ahh thanks lovely. Yarnporium was fabulous, but I entirely understand the need/urge to focus on a new house (SO excited for you!). Hee, I hope all the toddlers in your life will appreciate them! Just finishing with the last fiddly bits of both patterns this week, so hopefully they’ll be out soon. I really like the green shorties and your Afternoon Tea ones are lovely. That cable is an eye magnet. 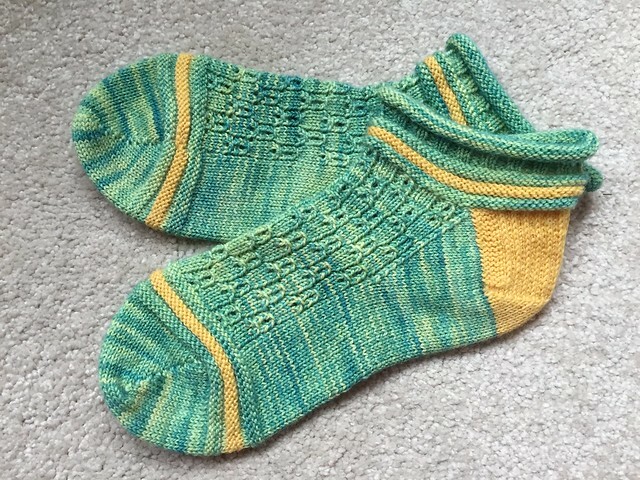 I saw your amazing socks at Yarnporium! The colours are wonderfully bright 🙂 hope you got a chance to wander around the marketplace over the weekend. Aw yay! So glad they have been seen in person 🙂 And yes I very much did – was in on Saturday to go to a talk and have a proper browse and shop around the marketplace, and picked up some beautiful things (what a lovely festival it was, I hope you enjoyed it).